The effects of implementing Directive 91/271/EEC of 21 May 1991 (Waste Water Treatment Plan Directive) and Directive 91/676/EEC of 12 December (Nitrates Directive) are analysed in 7 Portuguese estuaries (Minho, Lima, Douro, Mondego, Tagus, Sado and Guadiana) and two coastal lagoons (Ria de Aveiro and Ria Formosa), with a modelling approach. MOHID Water Modelling System was used to perform simulations with three nitrogen load scenarios for each system: a reference scenario, a 50% nitrate removal by agriculture scenario and another with a 100% nutrients removal by waste water treatment plants (WWTP). It is shown that the interaction between hydrodynamic and ecological processes is an important feature to study trophic problems in estuaries. Ecological processes such as primary production only occur inside the system if the residence time of water is high enough to enable organismal activity and if the adequate conditions are found (e.g. light, nutrients, temperature). From the model results it is possible to conclude: (i) in systems with short residence time a reduction in nutrient load will only produce a decrease in nutrient transit and will not affect the system’s global ecological status (e.g. Douro Estuary); (ii) in systems with long residence time the effects will range from significant, when primary production is mostly limited by nutrients (e.g. Ria de Aveiro), to non-significant, when primary production in the system is light-limited (e.g. Tagus Estuary). 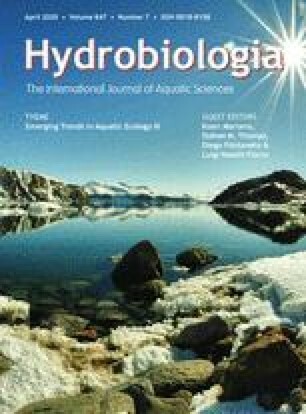 This research was made possible within the framework of a project of Portuguese National Water Institute (INAG) to evaluate water quality in Portuguese estuaries. The authors would also like to thank the contributions of two anonymous reviewers.